Hello guys i'm proud to present you the new Pixel Mixers album: Harmony. This one is called “Harmony” and it covers 25 songs from the Playstation 1 classic game “Rayman” developed by Ubisoft. 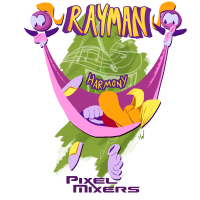 Rayman on PSX was the first video game that I played when I was a child and because of that the game and its music both have a special place in my heart.